The flowering stems of this bulb emerging from the bare ground is a sign that summer is coming to an end in the Cape. 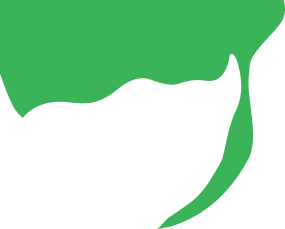 The bulb is typically large, brown and rounded and has a moderate growth rate. The large clusters of scented, trumpet-shaped pink or white flowers are carried on a long purplish-red and green stem appearing 50cm above the soil. Up to twelve flowers are produced from the flowering stem. These flowers are 10cm long and apically flare open about 8cm. Protruding from each flower is a long upturned style amongst a group of large curved anthers. The anthers are black and shiny at first, but split open to reveal masses of sticky white pollen. The inflorescence tends to face the direction that receives the most sun. Although most flowers are pale pink, white and dark pink forms occur. The strap-like leaves are deciduous and are produced after flowering. The leaves remain green throughout the winter period. The leaves produce a starch, which is stored in the bulb. In summer the leaves die back and the bulb becomes dormant. This strange phenomenon of flowering before the leaves appear is known as hysteranthy. The belladonna lily's specific flowering time is late summer, February and March. The family Amaryllidaceae forms a large group of over sixty genera, which are mainly centred in the southern Africa with smaller distributions in Andean South America. 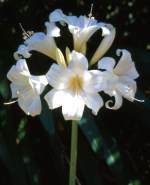 Other genera that belong to this family that have horticultural importance and are found in southern Africa include Clivia, Crinum, Cyrthanthus, Nerine and Scadoxus. Hippeastrum, which some gardeners mistakenly call amaryllis, is a large South American genus. Other northern hemisphere genera include Narcissus (daffodils) and Leucojum. There is still some mystery as to what pollinates the March lily. Rudolf Marloth, a famous amateur botanist, believed that the belladonna lily was being pollinated by a hawk moth. It was also noticed that large carpenter bees visited the flowers during the day. 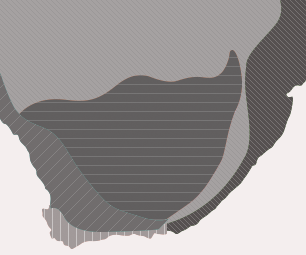 On the Cape Peninsula, at least, it seems that bees are the main pollinators of the March lily. Amaryllis belladonna in its natural habitat is found in small dense groups among rocks. Therefore the best place to plant them would be in a rock garden. In a created landscape, Amaryllis can be used mixed in between blue Agapanthus as a good combination, as the evergreen leaves of the Agapanthus provide skirts for the naked ladies. They can also be grown between a ground cover or mixed annual or herbaceous border. The cultivation of Amaryllis belladonna requires very little attention. 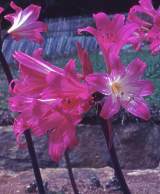 Amaryllis belladonna can be grown from seed. The soft fleshy white to pink seed should be planted when fresh. Dispersal of seed in winter is normally by wind. Seed dispersal is timed to coincide with the first winter rains in late March and April. Germination can occur in two weeks, but seedlings require three to six years or longer to flower. 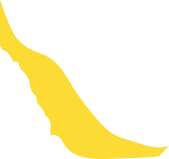 Large clumps of bulbs can be divided from the mother bulb during the dormant period. The bulbs and offsets can be planted immediately. The bulbs must be planted with their necks at soil level. The belladonna lily can also be grown in large pots using a very porous soil mix. The bulb can also tolerate quite arid conditions. In cultivation flowers are produced almost every year but in the fynbos they emerge prolifically after fires. 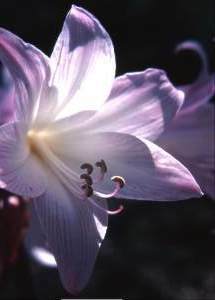 Amaryllis belladonna is often attacked by a highly destructive black and yellow striped caterpillar called lily borer. The caterpillar bores into the leaves and stem of the lily causing the flowering stem to collapse. The caterpillar eventually enters the bulb. The caterpillars can be removed by hand or the affected foliage can be cut off. Doutt, R L, 1994. Cape Bulbs, Timber Press.